A deep, unflinching, painful 1978 chamber drama by Ingmar Bergman starring Ingrid Bergman as the concert pianist-mother and Liv Ullmann as the frustrated daughter. Lena Nyman of I Am Curious Yellow fame also gives an astounding performance as Helena, the crippled daughter cared for by Ullmann’s character. Viktor, Ullmann’s character’s husband, is played with warm understatement by Halvar Bjork. I’ve often said “We do it to ourselves and we do it to others” which is played out numerous times in this conflicted attempt to resolve three women’s relationships during the mother’s first visit in seven years to see her daughter in the country. The mother did not love her girls and shunted them to the side as her successful musical career developed. Naturally there is guilt, bitterness, and accusations to be voiced in this talky melodrama which has many biographical references to the lives of the two Bergmans and Ullman. This was Ingrid Bergman’s last big role before she succumbed to cancer and she wanted to work with her namesake, though his style and the script led to many conflicts between the two. Viewers have never seen Ingrid Bergman this vulnerable and honestly exposed, something which she initially resisted, but eventually gave in to. 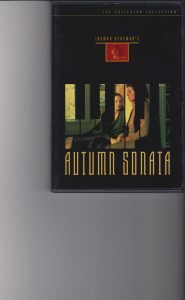 Autumn Sonata is not only classically ‘heavy’ (like olde classic stage dramas), but it is wonderfully deep, complex, intense, and extremely thought-provoking. Viewers cannot remain on the sidelines; director Bergman pulls viewers in and up close, especially in the film sonata’s middle which cuts to the core of these characters’ cores. The two versions of Chopin’s Prelude no. 2 in A Minor are the musical objective correlative and climax for this section. There is, indeed, much to say about this film, but if you are really interested in exploring further, a second viewing with esteemed critic Peter Cowie’s fascinating audio commentary peels off a zillion layers which went on during this production which almost did not get done. Top marks for a soulful and intelligent, sensitive drama which speaks more volumes than myriad weak, inferior modern tv and films about women’s relationships and issues. 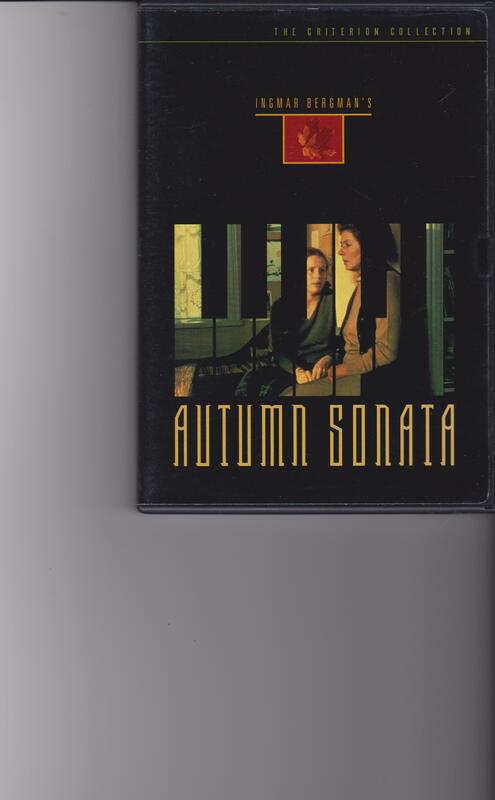 Autumn Sonata is a veritable classic from a great film master.